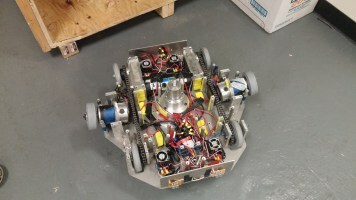 I've been the Electrical Team Leader for UTD Combat Robotics since late 2014. 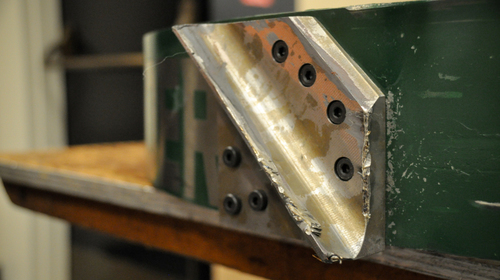 Since then, I've led a number of projects to improve the electrical systems of our flagship combat robot, The Blender, including developing more efficient motor controllers, and setting safety standards for wiring, power-on, and charging. The Blender’s primary weapon is a round titanium shell equipped with four steel teeth. This shell acts like a flywheel, supported by truck bearings in the center and spun by two brushed motors attached to wheels on the sides. These motors are supported by individual spring suspension systems, allowing the shell to wobble without destroying the robot inside. Underneath the shell lies the drive system and the necessary electronics. The Blender’s drive-train consists of two gearboxes driving four wheels via chain. The four motors on the robot, two drive and two spin, are controlled with our home-built motor controllers. 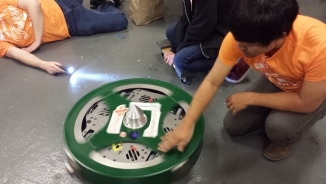 Six packs of 24V Lithium batteries power the robot for up to five minutes at full power.